to describe the procedure of conducting standard consistency test. The standard consistency of a cement paste is defined as that consistency which will permit a Vicat plunger having 10 mm diameter and 50 mm length to penetrate to a depth of 33-35 mm from the top of the mould shown in below fig. The appartus is called Vicat Appartus. 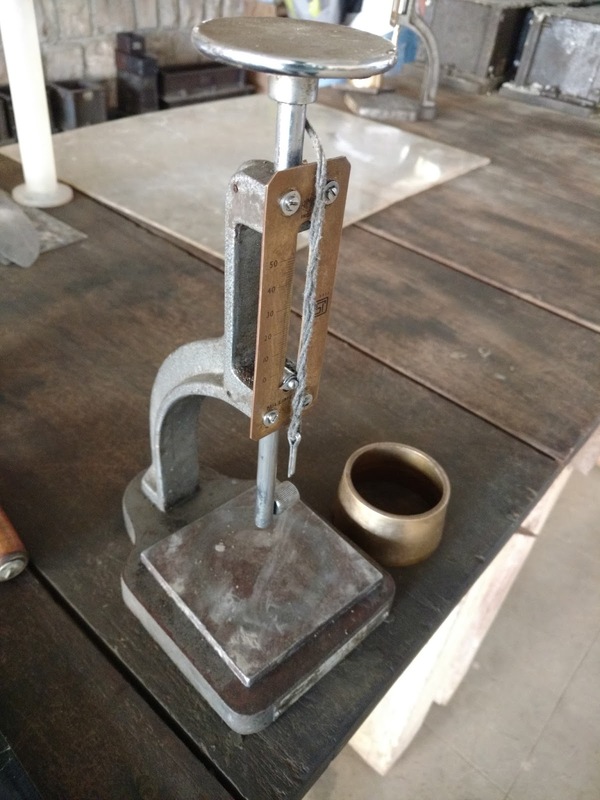 This appartus is used to find out the percentage of water required to produce a cement paste of standard consistency. 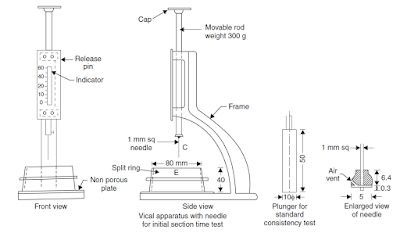 percentage of water which allows the plunger to penetrate only to a depth of 33-35 mm from the top is known as the percentage of water required to produce a cement paste of standard consistency. This percentage is usually denoted as ‘P’. The test is required to be conducted in a constant temperature (27° + 2°C) and constant humidity (90%). Initial setting time and final setting time are the two important physical properties of cement. Initial setting time is the time taken by the cement from adding of water to the starting of losing its plasticity. Final setting time is the time lapsed from adding of the water to complete loss of plasticity. Vicat apparatus is used for finding the setting times. Vicat apparatus consists of a movable rod to which any one of the three needles shown in figure can be attached. An indicator is attached to the movable rod. A vicat mould is associated with this apparatus which is in the form of split cylinder. 300 gms of cement is thoroughly mixed with 0.85 times the water for standard consistency and vicat mould is completely filled and top surface is levelled. 1 mm square needle is fixed to the rod and gently placed over the paste. Then it is freely allowed to penetrate. In the beginning the needle penetrates the paste completely. As time lapses the paste start losing its plasticity and offers resistance to penetration. 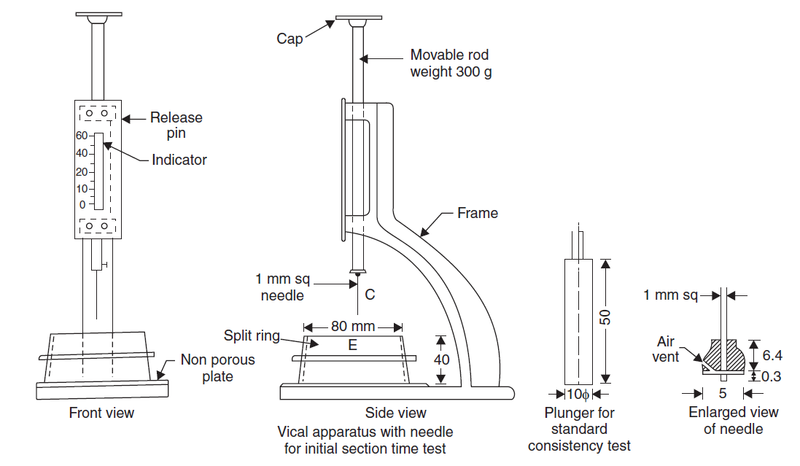 When needle can penetrate up to 5 to 7 mm above bottom of the paste experiment is stopped and time lapsed between the addition of water and end if the experiment is noted as initial setting time. The square needle is replaced with annular collar. Experiment is continued by allowing this needle to freely move after gently touching the surface of the paste. Time lapsed between the addition of water and the mark of needle but not of annular ring is found on the paste. This time is noted as final setting time.